In the chapel at NEST with my well-worn, broken-spined journal of travels with the living Christ in Lebanon, Syria and Iraq. I always take it with me, even though the people are engraved on my heart. I had a new experience today. 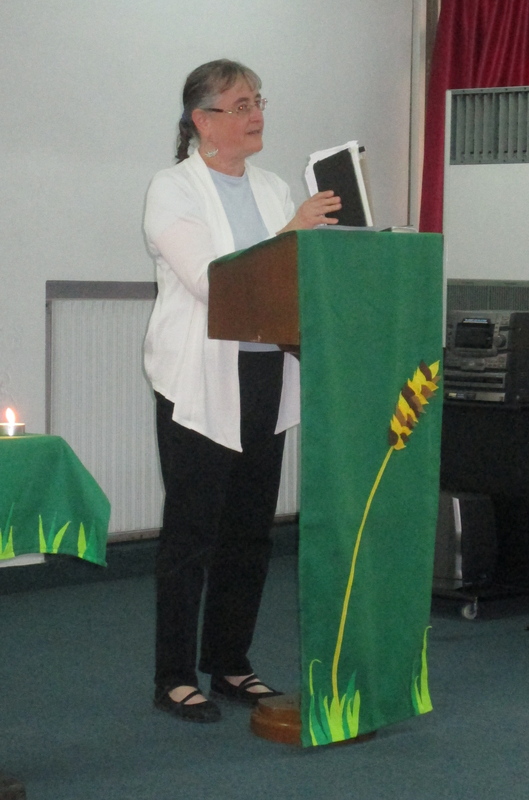 I was asked to bring the message to the chapel at the Near East School of Theology today in Beirut, Lebanon. I had prepared it about three weeks ago and have been pondering about it ever since. I am not good at self-critique, but I did edit it several times, never taking anything out, but adding to it. Originally I was going to talk about the story of “Hope Came Down,” which you can watch at the end of this post. But what came out of me was the story of how scripture has become real to me in the people I share my life with. God’s story has intersected with mine in a powerful way. And that is what I shared. I stand before you as a student, as a member of a flock. I am not a shepherd or a pastor and I find it amusing and humbling to be bringing a word to this gathered group of pastors and leaders and students who will one day be pastoring and shepherding your own flocks. I am a business administrator. I work with numbers and it is a very rare opportunity when anyone gives me the podium or lectern. I have a tendency to talk when given the opportunity…just ask my husband. And though I can speak confidently and clearly about numbers (and they will be accurate!) I usually like to remind people that numbers tell a story. And so today as I come before you, I will be a storyteller. I want to tell you through personal stories how shepherds and pastors and indeed, students, have taken God’s story – his word – and made it more than just words or numbers on a page. They have made these words part of my life and given me understanding of them in ways I could never have learned in a classroom. My prayer for you here, now, studying to be pastors, is that you would bless people in this same way. That is the first scripture I memorized and I did that in May, 2001, while visiting the Presbyterian Church in Cameroon. I learned it alongside a classroom of about 150 children. And all of us memorized it with the entirety of the Sunday school children in the PCC that Sunday…tens of thousands of them! I had read the Bible completely through three times by then, but a scripture never came as alive before that Sunday. I stood in front of a large congregation on Pentecost Sunday in 2004 when I returned as the leader of another trip that our church made and I recited it…and they all recited with me, having learned it with me three years earlier! I could see that the Holy Spirit had indeed descended upon this group of brothers and sisters so far from where I lived, and that they were great witnesses for the Lord. I learned a lesson about riches there as well: money in your pocket or in your bank account does not make you wealthy. True wealth is being transformed by God’s power and spirit and sharing that wealth through witnessing for God and telling his story. Those words were declared for Steve and me as we exchanged vows and rings in a service of Christian marriage on May 18, 2002. Can you imagine two 43-year-olds discovering the reality of that promise one year after their first date? It’s a living word, isn’t it? And Steve and I have experienced God’s grace in those plans which were not our own, but his, and those plans have included returning here again, to be with the family of God at NEST. Steve and I live with and care for my sister, Jana. Jana was hit by a train almost 32 years ago, and her life is difficult. She has trouble walking, trouble talking and these days does not have much strength. But in these last almost 32 years she has traveled to Ecuador to work with orphans and to help install a waterline to a native village high in the Andes. She has been back and forth to Washington, D.C., many times to advocate for poor and hungry people all over the world. She has led her sister – that would be me – back into the community of faith, which is how the first two parts of this story happened! She does wait upon and hope in the Lord, and I know that a day is coming in the kingdom of heaven where she will walk and dance and run and soar on eagle’s wings, renewed in an eternal strength that does not run out. This is the verse that speaks to Jana’s heart. In August, 2010, I traveled for the first time to Beirut with Marilyn Borst and the Outreach Foundation. Marilyn was the first Presbyterian I had ever met who gave me an amazing picture of a church I have since come to love very much, and this was the scripture she put on the hearts of eight women who traveled here that very hot summer to see in this part of the world what the church has done, what the church is doing and what the church is leaning into for the future – that sure hope we have in Jesus. And we met those who had lived through fifteen years of civil war and who had endured and kept the church alive through faith and love and hope, people like Dr. Mary Mikhael and Assis Nuhad Tomeh. I still remember sitting in a room just down the hall from here listening to Assis Adeeb Awad tell of his travels as a pastor during those years of war, all the while holding those prayer beads. Pray without ceasing… you can find that in I Thessalonians 5:17. And I do. I want you all to know that you come to bed with me every night as I pray for peace in these lands. I was hooked! And I have returned. I have witnessed these scriptures, now all so dear to my heart, in three dimensions and in living color in the people and places I have walked in Lebanon, in Syria and in Iraq. They are not just black words on a white page speaking to a people from long ago. They are words lived out in the here and the now by children of God who have inhaled the breath of his spirit. And as I have said, I have returned to this place. This is my second trip this year and my fourth overall to Lebanon. While here in January, Steve and I had the opportunity to visit a large refugee camp near Zahle. I had been in that part of Zahle the previous May and had visited a small camp of about 45 families. In January, however, the camp we visited was 500 times the size of the small one and we were told it was one of two, neither of which had existed the year before. I was prepared to be overwhelmed with sadness and hopelessness. And then the children appeared. They surrounded us with singing and laughter and soon we were all dancing together in a big circle, enlarging as more joined in. I found out later these sweet ones were singing, “Yesterday I lived in a house. Today I live in a tent, but tomorrow I will live in a house again.” Our President Obama wrote a book called The Audacity of Hope. I have never read it, but I had just witnessed it all around me. It struck me in a way that nothing ever has and that evening as we rested in a hotel in Damascus, I wrote a poem called “Dancing in Circles” about that experience. And when I came home and looked at the pictures I saw the dear smiling faces of the clergy who were with us. The pastors in that area have visited the camps many, many times, carrying the love and the joy and the hope of Jesus into a place where he is so desperately needed. And I couldn’t help but think of the scripture I had heard so often from John 1:14, “The word was made flesh and dwelled among us,” or as Eugene Peterson puts it in The Message, “he moved into the neighborhood.” And I of course remember my own pastor George phrasing it like this: “He pitched his tent with us.” His glory – his shekinah – his tent was right in the middle of ours. There it is: Hope came down. And those children were hopeful! And the passage from Hebrews 11:1, “Now faith is being sure of what you hope for, certain of what you do not see.” And those kids were singing that tomorrow they would be in their homes again. I couldn’t see it, but they could! That is a hope-filled faith and that is what I want to honor. And so a vision given to me by God through his word and through his witnesses here kept me busy all year trying to fulfill it. It is in the words of the song “Hope Came Down” and the pictures of it being fleshed out in a refugee camp near Zahle, Lebanon. And I have sent it out into the world so that God may be glorified through the work of his church. God has plans for us all and when the Holy Spirit comes upon us, through his power we will be witnesses of justice and compassion; we will be humble laborers of love in the midst of tents of refugees; and we will be certain of what we do not see but sure of what we hope for…and we will endure, inspired by the hope we have in Jesus. And in the waiting and the hoping, we will be renewed.